I had a dilemma last night because I have previously made and deleted a fan page that I created under the name RealAsianBeauty. I set the page into a setting that I can't get back to default so I decided to just go ahead and delete it, but I forgot that I have already set it's URL under my name. Now, I need to use it and Facebook is telling me that it is not available anymore. :( My mom even laughed at me while I was hating myself because she said I was too (as always) impulsive. 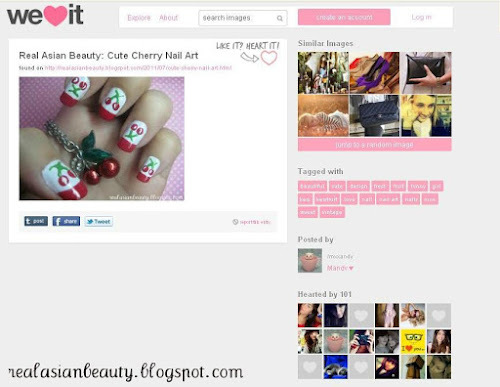 So today, I Googled the name RealAsianBeauty to see which links would appear on the search results. I found this very interesting link that was in the search result. It says WE ♥ IT. I don't remember posting any picture or link on that site so I was really curious. 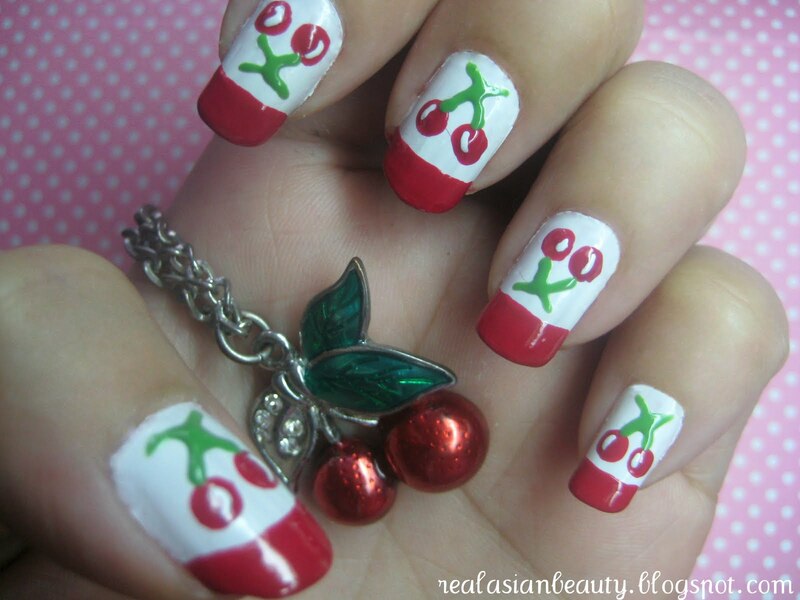 This was a nail art design that I just randomly came up with sometime in July 2011. Click here to see the previous post about this Cute Cherry Nail Art. I was really happy to see this photo on that website because I honestly love that site,too. I always get wallpaper and cute photos from there and it was really flattering to see one of my works on it. It has 101 HEARTS as of the moment which is totally cool! I saw that an awesome girl named Mandy from Netherlands hearted and posted it. I tried to figure out how I could contact and thank her but I failed. So, I'm posting this as a sign of gratitude to Mandy and YOU (my silent but loyal reader) for appreciating my simple work of art. It may not be a lot for other people but I was sincerely happy and grateful when I found the photo. I am not a professional artist and I know that there's still a lot out there that I need to learn and discover so I will always try to do my best and come up with more works that people would HEART!